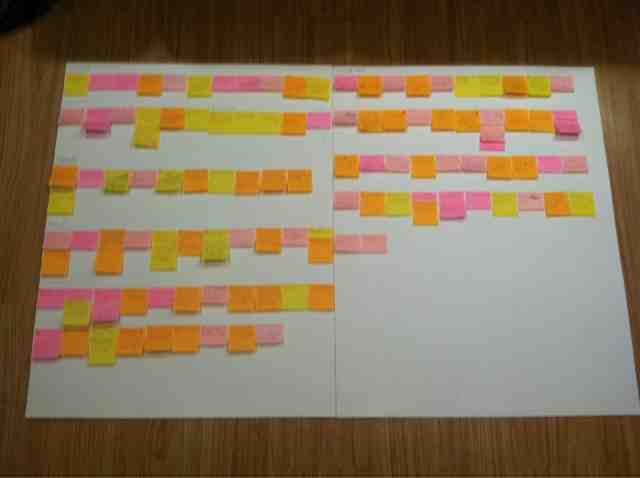 Normally I'm not much of a plotter, not in the first draft, anyway. Once I find the starting point of a story I like to follow where it leads and it can be a surprise to me too to discover how it ends. Further drafts will of course then require a great deal of reshaping, but I've learned the advantage of having a lot of raw material to work with even when much of it will be later tossed aside. I have to turn this into what??? This is a level of plotting I've never attempted before, but when I wove together the journeys of these six different characters I discovered holes I wouldn't have otherwise been aware of until I had tried to write the scenes. Instead I was able to iron out many structural issues before setting down a single word. Well. Now I just have to write the thing. For the past couple years I have been working on a children's book called "The Mighty Carrot" about a rabbit named Carrot who finds a red handkerchief, puts it on, and becomes a superhero. About a year and a half ago I was fortunate to land in a writing workshop run by Jane Resh Thomas. It was pure serendipity and I greatly appreciate being a part of such a talented group of writers. To have a group such as this to laugh with, learn from, and to be supported by is invaluable. 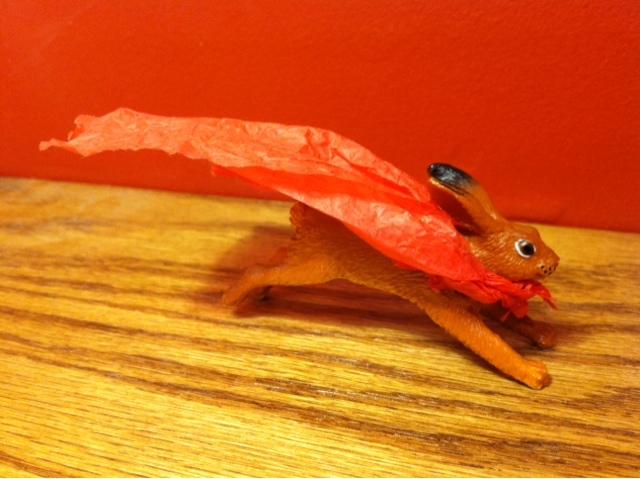 He's the perfect Carrot, captured in motion while off to foil some nefarious scheme. He now sits next to my computer and will be there to help inspire me and remind me of how far I've come. These writers, the "Muskrats," are my heroes. They are tackling all manner of stories from a young Norwegian immigrant in Minneapolis to the devastation of Nagasaki, stories make me laugh and cry and fill me with wonder (I will never look at crows the same way again). And they remind me that a little bunny with big dreams is important too. This past weekend the Coffee Queen and I celebrated our 10-year anniversary. (And no, it doesn't feel like that long.) My original plan for the day was to take the Symba out for a picnic by one of the Twin Cities' many lakes. After all, it's May, right? How bad can the weather be? It was in the 70s early last week. It was in the 70s yesterday. Last Friday it was 30s/40s and raining. At one point the sky starting spitting ice and we decided that we were really, really not meant to have a picnic. But the Coffee Queen and I are nothing if not adaptable. So instead we went out to lunch at the Jasmine Deli, a wonderful little place on Nicollet Ave in Minneapolis. We both enjoyed our meals, but I think the Flaming Wontons were the best. We followed that up with a visit to the Minneapolis Institute of Arts. We don't make it to the MIA very often and without a toddler (the Little Scoot made a visit to the grandparents) we were able to visit the galleries at our leisure. For some reason I often forget what an amazing art museum we have right here in Minnesota. I'm particularly fond of the Impressionists, and they have a couple of great Monets. The Coffee Queen's favorite is the Van Gogh. On Saturday the Little Scoot went to the other set of grandparents for an overnight visit (we hardly knew what to do with ourselves having so much toddler-free time this weekend!) while the Coffee Queen and I volunteered to pack food at Feed My Starving Children through our church. I've been there several times now since the fall and I never cease to be impressed at their operation and how they've worked to make their process as efficient as possible. There were about 100 volunteers in our shift and in less than two hours we packed enough meals to feed 80 children for a year. Lastly, to round off the anniversary celebration, we went to Theatre in the Round's production of Treasure Island. This is the first time in years that the Coffee Queen and I have been able to go to a play together. Wow! We know the director, Noah Bremer, and his high-energy style of theater was evident throughout. It was a really fun show filled with swashbuckling pirates and lots of humor. My brother's new girlfriend, Megan, was in the show and was fantastic as the Squire Trelawney. We had a great time. All in all a wonderful weekend spent with the Coffee Queen, my amazing wife of now a decade plus! The Little Scoot had fun too. Who doesn't love a bird whistle? Last Saturday the Little Scoot and I decided to take advantage of the beautiful Saturday morning and head out for a bike ride. He was excited to get out and about. While the Coffee Queen went for a run around the lake, the Little Scoot and I headed along the south side of Como Park and over to the Java Train Cafe. Not for coffee. I don't drink it, despite the Coffee Queen's best efforts, although the Little Scoot occasionally does (yes, really). No, we went for ice cream, of course. The Little Scoot asked for the "blue" (cotton candy) and I felt like mint chip, so we compromised and had both (naturally). Getting all the good out of that ice cream.